With network-attached storage (NAS) solutions from multiple vendors touting increasingly similar feature sets, it can be tricky to differentiate one NAS from another. That isn't advantageous for any manufacturer wanting to stand out from the crowd, so it's no surprise that the biggest names have branched out with select models targeting specific usage scenarios. 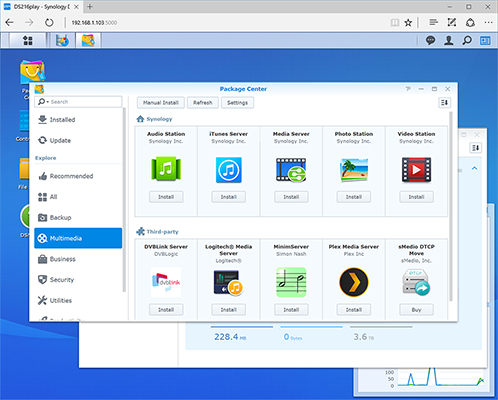 One of the best examples is Synology's 'play' line of NAS solutions. Designed with home entertainment and video streaming in mind, the play range has become a popular choice among multimedia enthusiasts looking to centralise their photos, music and movies, and serve the content to a wide array of connected devices. The DS216play, in for review today, attempts to bolster Synology's multimedia range by offering 4K video transcoding in a dual-bay unit priced at around £200. 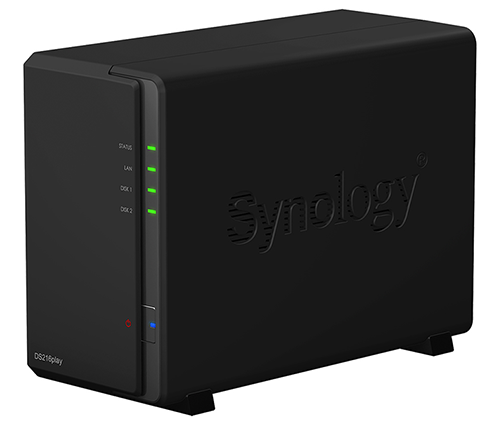 Measuring 165mm x 100mm x 226mm in size, the compact, matte-black box retains a familiar Synology aesthetic and keeps it simple with regards to ports and access. Neither drive bay is assisted via a hot-swappable tray, meaning the chassis must be slid open for initial drive installation, and the front of the unit is home to five status LEDs and a solitary power button. All the ports are tucked around back, and these include only two USB ports (one of which is of the SuperSpeed 3.0 variety), a Gigabit Ethernet jack and a connector for the external, 60W power supply. 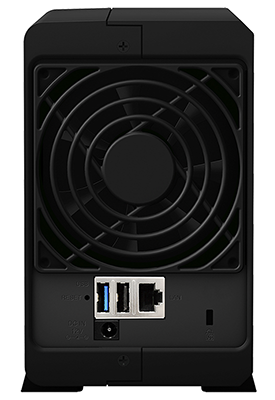 Cooling is catered for by a quiet 92mm fan, but with no SD card slot, HDMI out, IR receiver nor front-facing USB, the DS216play can be considered somewhat basic in terms of connectivity. What sets the NAS apart from most others in this field is the choice of hardware under the hood. Synology employs 1GB of DDR3 memory and a dual-core, 1.5GHz processor from Swiss-based STMicroelectronics. Dubbed the STiH412 Monaco Ultra, the 32-bit part is said to be able to deliver read and write speeds of up to 107MB/s and 91MB/s, respectively, in a RAID 1 configuration, but the chip's real claim to fame lies in its ability to transcode 4K video in real time. Courtesy of ST's Faroudja Transcode Engine, the ARM-based SoC can transcode H.265 4K content to 1080p at up to 30fps, making it suitable for viewing on a mobile device where performance may be limited. It's worth noting that many modern devices, be it smartphone, tablet or PC, can cope with native 4K content should network bandwidth be sufficient, but if transcoding is required, the DS216play is up to the task. Transcoding ultra-high-resolution video needs to be high on your list of priorities for the DS216play to warrant consideration over competing NAS solutions, yet the device isn't a one-trick pony. It runs the award-winning and hugely popular DiskStation Manager operating system, providing users with a broad feature set encompassing all the usuals; media server, iTunes, backups, download station and much more. One proviso to be aware of is that the 4K transcoding capability is limited to Synology's core apps. Given the use of an ARM-based processor, the DS216play's hardware transcoding engine is harnessed only by Synology's Video Station, DS Video and Media Server apps and, in contrast to the older Intel Atom-based DS214play, isn't applicable to popular services such as Plex. 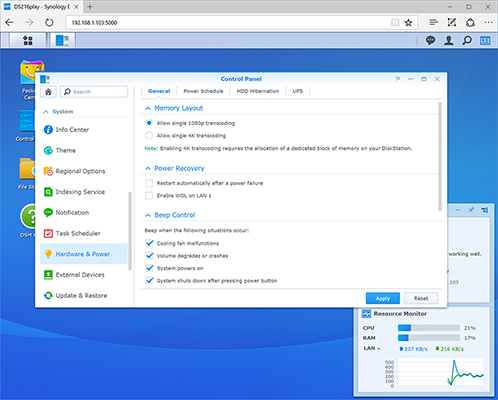 A full breakdown of the server's transcoding capabilities is available at Synology.com. It's also interesting to note that, while 4K transcoding is a key selling point, the feature is disabled by default in order to preserve hardware resources. 4K transcoding must be enabled via the control panel, and doing so results in a dedicated block of memory being allocated for transcoding duties. 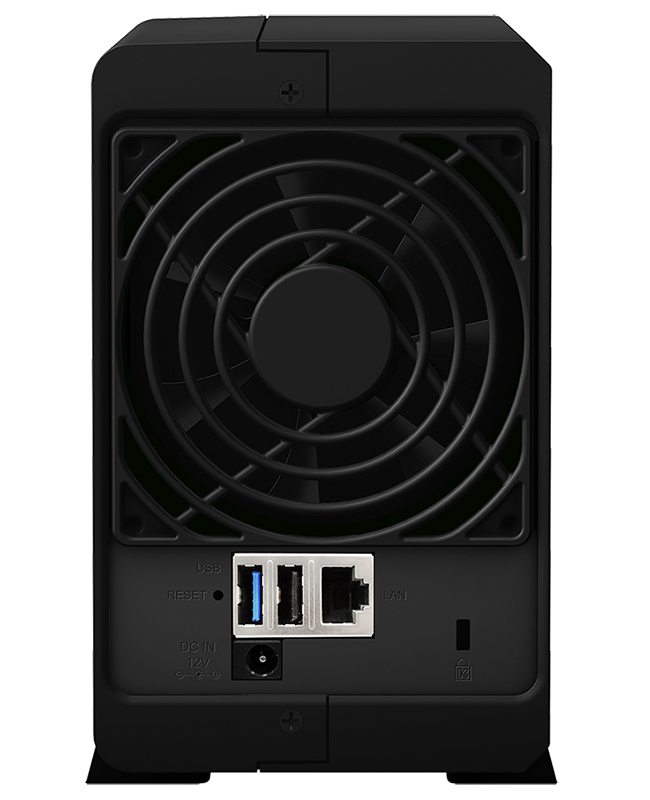 The demands of on-the-fly hardware transcoding remain significant for a consumer NAS, and it isn't uncommon for CPU usage to exceed 80 per cent when the DS216play is working with 4K content. Do keep this in mind if your server is going to be carrying out multiple tasks simultaneously. 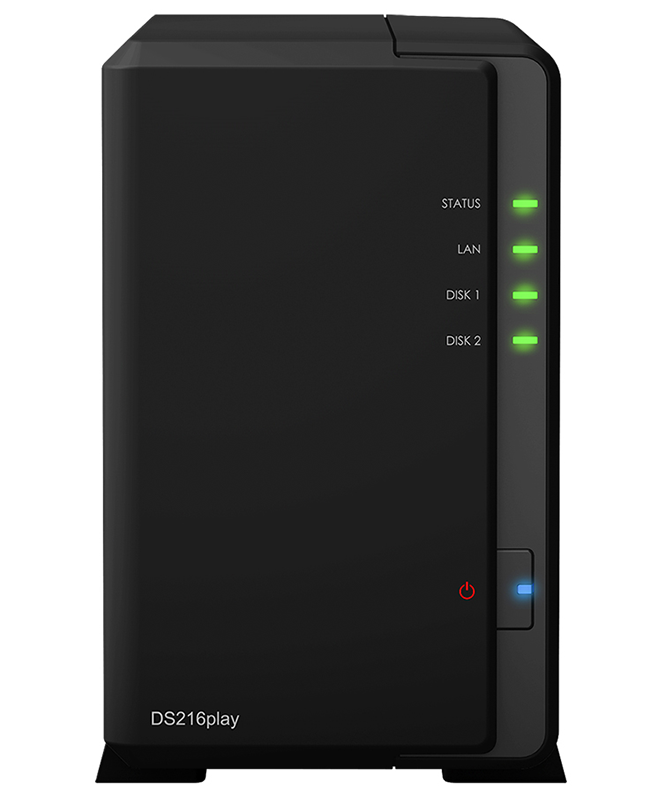 Synology's target audience is clear, however; the DS216play does carry a premium that can be avoided if you find that video transcoding is becoming less of a priority now that more devices support streaming of high-resolution content. 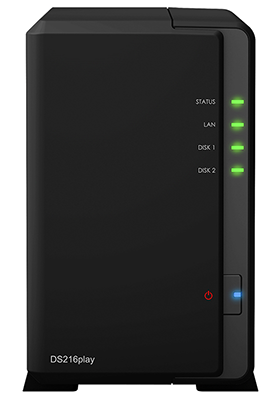 Case in point, the recently reviewed DS216j lacks support for 4K transcoding but offers an extra USB 3.0 port and plenty of NAS goodness at a competitive £150 price point.